Two months ago I posted about how to make an extra $20,000 this year and the 2017 Flip Challenge set by Gary Vee. In my first month, I made $2,710, mostly by selling stuff. This is my second update and it’s different! (Edit, now I make $10,000 a month. Read about it here). The challenge is meant to be specifically about buying stuff to resell or ‘flipping’ items. Before I share my total for the past month, here’s how it went down. As mentioned in my last update, I spent time in another city. I wasn’t home for a week of the past 4 which meant I couldn’t buy stuff to resell. My personal life was a little messy (still is), but it’s starting to work out. Being paralysed, in excruciating pain meant I couldn’t do anything. There is a pain scale doctors use to determine how bad your pain is. Childbirth sits around 8. A level 10 is so intense you will lose consciousness. Most people never experience this kind of pain. That is the level I get. The pain is so bad I would rather give birth without drugs again like I did with my first child than go through this pain. This pain is the screaming, can’t talk, can’t breathe, can’t move, your whole body seizes up and you pass out pain. I would not wish it on my worst enemy. You can find out more about the pain scale here. I had this once before and spent most of 2015 dealing with it and doctors not working out what it was then it miraculously went away. I was able to walk again relatively quickly this time, which was great, the pain has been an issue though thankfully reduced from the first few days. This eliminated a chunk of the month and continues to cause issues, though nowhere near to the level it was. I had to get a new home, which meant this month my spare time went to house hunting, going to open homes, applying for quite a few and finally when I secured one, packing up my belongings and moving everything. I had a removalist move my things because of my back and I am starting over with nothing really, but I’m positive about it all. So how much money did I make flipping items? Nothing! How could I? I made money through my regular sources, my work, these sites etc. 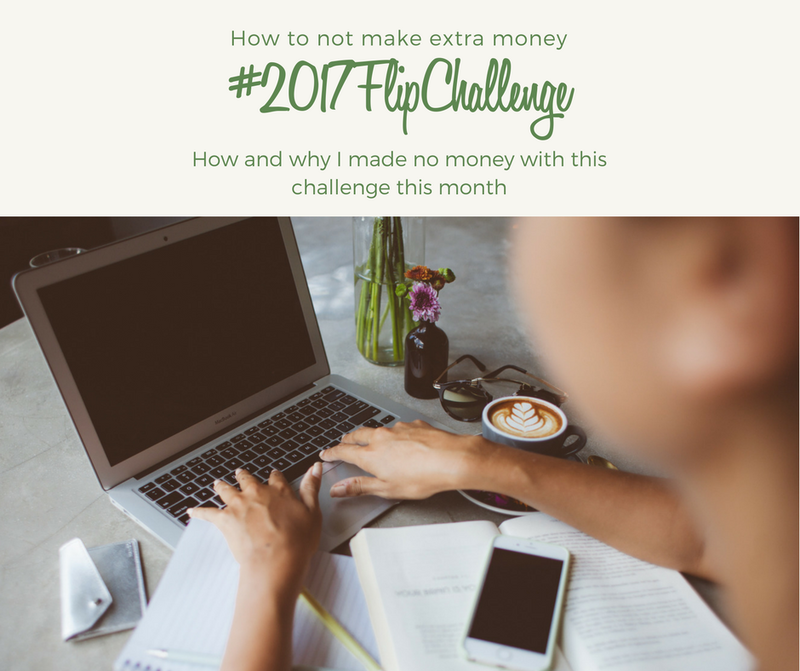 I picked up new clients, however, the flip challenge was the last thing on my mind. BUT… I do have one thing listed I am in negotiations for and if it comes through it will be a $2,000 profit on this one item. It will fall in my next update though. I was aiming for $20,000 through buying and selling items by the end of the year, just like the challenge. I am now down to $17,290 needed in 7.5 months or $2,305.33 per month. I do have items I can list for sale this month and know where to source items, what I like to sell etc. So I will continue with that and let you know how it goes, with screenshots. Are you making extra money on the side? What works for you? I have only recommenced actively selling on eBay during the last six weeks. I, “sold,” an item on eBay for the person to back out of the deal. I will be advertising more items to sell later this month. On the plus side, I did settle a court case yesterday and the Defendant will be putting some money into my bank account within the next three weeks. This money will go towards paying some unexpected expenses. I have also restarted my vegetable garden which will reduce some of my household’s food costs. I estimate that this will save my household approximately $30 per month on fresh produce. Meanwhile, I have started batch cooking and stockpiling when certain items go on sale. All in all, I plan to save my household approximately $10,000 per annum.